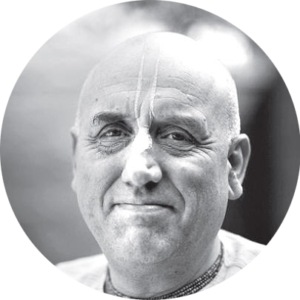 Born in 1955 in London in a Christian family, I have been a part of the theistic Vaishnava tradition of Hinduism since 1979. Although I am sometimes referred to as a Hindu priest, there is in fact no defined hierarchical priesthood within Hinduism, or rather the Vedic tradition. There is a class known as the Brahmins, whose business is to provide priestly services to society, such as rites of passage and spiritual instruction, and I would call myself an aspiring Brahmin under the guidance of my eternally liberated teacher His Divine Grace A.C.Bhaktivedanta Swami Prabhupada. I do not see my acceptance of the Vaishnava tradition as a departure from Christianity, but rather as a natural continuance of Christ’s teachings. As I see it, the instructions of all the great teachers, such as Prabhupada, Christ, Buddha, Mohammed, and many others contain the same essential teachings. All these prophets taught us to elevate our consciousness and try to go beyond this material world to reach the Supreme Absolute, who has many names such as Krishna, Allah, Jehovah, Buddha etc. Presently I am working full time for a charity, but I use all my spare time to write. My goal is to bring the wisdom of the East to Western audiences in an entertaining way. For me spiritual life should be an enjoyable experience that enables us to transcend the trials and tribulations of present-day materialism, and eventually awaken our loving relationship with God. I am available to give talks on the Vedas, along with their associated disciplines and teachings such as yoga and meditation. I can also give Vedic or Hindu perspectives on current events, either in written or spoken media.